Context: Chronic pelvic pain (CPP) is a common condition of women of the reproductive age group. It has a negative impact on a woman's personal health and quality of life (QOL). Practicing yoga has shown numerous benefits in various chronic painful conditions. Aim: To study the effects of yogic intervention on pain scores and quality of life in females of reproductive age group with CPP, on conventional therapy. Settings and Design: It is a follow-up, randomized case-control study done in a tertiary care hospital. Subjects and Methods: Sixty female patients of CPP in the age group of 18-45 years were randomly divided into Group I (n = 30) and Group II (n = 30). Group I received only conventional therapy in the form of NSAIDS and Group II received yoga therapy in the form of asanas, pranayama, and relaxation along with the conventional therapy for 8 weeks. They were assessed twice (pre- and post-treatment) for pain scores through visual analog scale (VAS) score and QOL by the World Health Organization quality of life-BREF (WHOQOL-BREF) questionnaire. Statistical Analysis Used: Repeated measure ANOVA followed by Tukey's test. P < 0.05 was considered significant. Results: After 8 weeks of yogic intervention, Group II patients showed a significant decrease in intensity of pain seen by a decrease in VAS score (P < 0.001) and improvement in the quality of life with a significant increase (P < 0.001) in physical, psychological, social, and environmental domain scores of WHOQOL-BREF. Conclusions: The practice of yoga causes a reduction in the pain intensity and improves the quality of life in patients with chronic pelvic pain. Yoga is an effective, time-tested method for improving overall health and managing psychosomatic and chronic degenerative disorders. Practicing yoga regularly has shown improvement in QOL and pain reduction in chronic low back pain. , Prevalence of musculoskeletal pain (neck pain and lower back pain) was found to be lower in dentists with regular yoga practice as compared to dentists practicing other physical activities or with no physical activity. Yoga therapy has shown a reduction in severity and duration of pain in women with primary dysmenorrhea. Literature survey however has shown a paucity of studies on the beneficial effects of yoga on pain and QOL in females with CPP. We hypothesized that the use of yogic intervention used along with conventional therapy in CPP patients will help in improving visual analog scale (VAS) score and QOL as compared to conventional therapy alone. The primary objective of our study was to measure VAS score and World Health Organization QOL-BREF (WHOQOL-BREF) scores in CPP patients on conventional therapy and in CPP patients on both conventional + yoga therapy. It was a follow-up, randomized case-control study. Eighty CPP patients were recruited from gynecology outpatient department. All subjects underwent complete physical and clinical assessment prior to the participation. Subjects with CPP were randomly divided into two groups Group I and Group II. Simple randomization was done using a computer-generated random number table, and allocation was done by sealed envelope technique. However, nine subjects in Group I could not come for follow-up and ten subjects in Group II showed poor compliance to the yoga regimen. Hence, we selected thirty subjects in each group to participate in our study. Prior to the participation, all the subjects were explained the purpose of study in detail and a written informed consent was taken. This research proposal was approved by the Institutional Research Protocol and Ethics Committee. Any other medical disease complicating CPP. Pain assessment was done using VAS and QOL assessment was done through WHOQOL-BREF questionnaire. Both groups (I and II) underwent assessment for the outcome measures at the beginning as well as after 8 weeks of respective therapy. [Figure 1] depicts plan of the study. Group I received only conventional therapy in the form of analgesics mainly NSAIDS (nonsteroidal anti-inflammatory drugs) as and when required for pain (CPP). Group II subjects underwent regular supervised yogic regimen which included deep breathing, OM chanting, asana, pranayama and relaxation, etc., [Table 1] for 5 times a week for 8 weeks under the expert guidance of highly trained yoga specialists and trainers (having 5-10 years' experience in teaching yoga possessing MD/PhD in yoga) running the yoga center in Physiology Department under Central Council for Research in Yoga and Naturopathy. All the subjects practicing yoga were beginners. They were thoroughly supervised by the instructors to carry yoga correctly. Attendance of the subjects was maintained regularly by the instructors. Yoga was performed in a quite environment in a batch of 10-15 subjects of CPP. The yoga sessions were carried out from 10 to 11 am. They also received conventional therapy in the form of NSAIDS (as and when required) for CPP. Data were analyzed by IBM SPSS Statistics 20 software (by IBM Corporation, USA). Two factors repeated measure ANOVA followed by Tukey's test at 5% level of significance. One factor is group (Group I and Group II) another factor is time (pre, post) for comparison of mean pain score and QOL scores before intervention and after intervention between the groups and within the group that is pre- and post-comparison for each group. The mean age of the subjects in Group I and Group II was 30.9 ± 5.59 years and 32.6 ± 6.97 years, respectively, and they were age-matched [Table 2]. At the onset of study, there was no significant difference of VAS scores between Group I (65.60 ± 5.89) and Group II (66.90 ± 8.40) subjects. After 8 weeks of intervention, Group II subjects showed a significant reduction (P < 0.001) in VAS scores (34.07 ± 10.12) as compared to Group I (67.03 ± 6.557) subjects indicating better pain reduction in Group II subjects. There was no significant difference between the pre- and post-treatment VAS scores in Group I subjects. A significant reduction was seen in posttreatment VAS scores (P < 0.001) as compared to pretreatment VAS scores in Group II subjects [Table 3]. 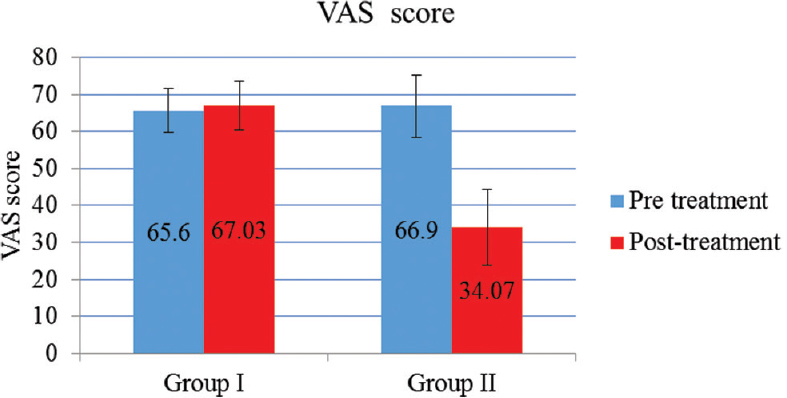 [Figure 2] depicts a comparison of VAS score before and after 8 weeks of intervention in Group I and Group II. 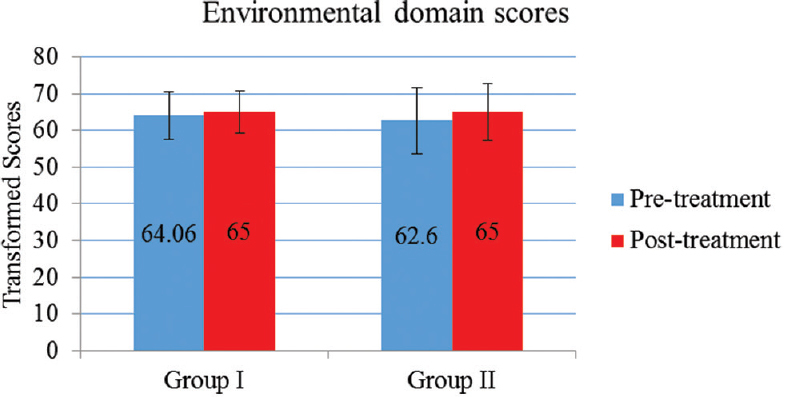 There was a significant difference between the pretreatment and posttreatment values of WHOQOL-BREF transformed scores (P < 0.001) in various (physical, psychological, social, and environmental) domains in Group II subjects. WHOQOL-BREF scores increased significantly in Group II after yogic intervention as compared to the Group I subjects [Table 4], [Table 5], [Table 6] and [Table 7]. 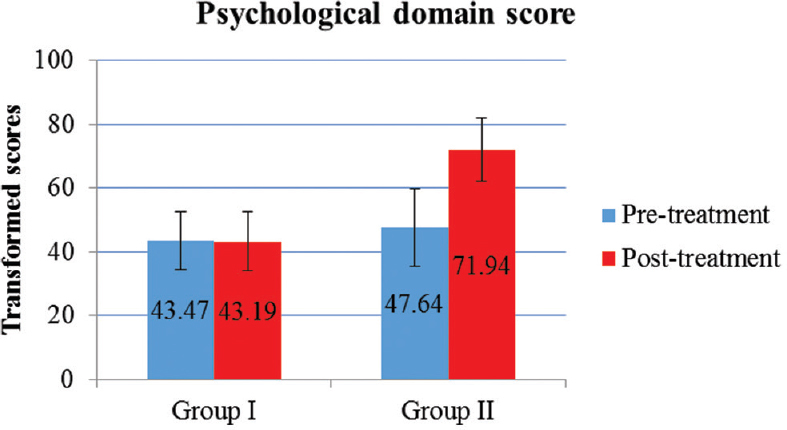 [Figure 3], [Figure 4], [Figure 5] and [Figure 6] depicts the comparison of the WHOQOL-BREF transformed scores in the physical, psychological, social, and environmental domain, respectively, before and after 8 weeks of intervention in Group I and Group II subjects. In the present study, 8 weeks of yogic intervention resulted in statistically significant decrease in the VAS scores, in CPP patients. However, no significant changes in VAS scores were seen in CPP patients receiving only conventional therapy (Group I). The difference in VAS scores between CPP patients on conventional therapy (Group I) and CPP patients on conventional + yoga therapy (Group II) postintervention were also significant. Decrease in VAS score is suggestive of decrease in pain intensity after 8 weeks of yoga therapy. Pain relief in gynecological conditions after yoga therapy has been reported in many studies. On extensive literature survey, we could not come across any of the study highlighting the role of yogic intervention on CPP patients. Hence, we do not have a similar study to compare our results. However, yoga nidra therapy of 6 months significantly reduced the pain symptoms in women with dysmenorrhea. Moreover, practicing yoga poses (asana) significantly reduced severity and duration of dymenorrhea. Other studies showing the effect of yoga on other painful conditions are also available. Yoga therapy for 5 times, 4 weeks a week, significantly improved VAS score in patients with myofascial pain syndrome. Practicing yoga asana for 4 weeks led to significant reduction of VAS scores in chronic low back pain patients. Moreover, yoga training reduced the intensity and frequency of headaches in patients suffering from migraine. After 12 weeks of yoga intervention, which included various asana, women with chronic low back pain showed a significant reduction in VAS scores of pain, significant increase in back flexibility, and significant increase in brain-derived neurotropic factor (BDNF). This increase in BDNF could be attributed to pain reduction in patients with chronic pain. Yoga therapy enhances the tone of muscles and helps in releasing of muscle tension. Relaxation exercises performed during yoga leads to reduction of stress-related muscle tension and also modify neurobiological pain perception which could be a mechanism for pain reduction. Increase in BDNF and improvements in the pelvic muscle tone after yoga therapy might be responsible for pain relief in CPP patients. Hence, improvement in pelvic and abdominal muscle tone and increase in the levels of BDNF along with brain GABA levels (as shown by previous studies) by yoga therapy may perhaps be attributed for the significant reduction in VAS score and improvement in QOL in CPP patients on yoga therapy. From this study, it can be concluded that after 8 weeks of yoga therapy, Group II CPP subjects had lesser intensity of pain as shown by significantly reduced VAS scores and improved QOL with a significant increase in physical, psychological, and social domain scores of WHOQOL-BREF. Hence, yoga regimen used in our study can be a used as add-on treatment for the pain relief and for improving QOL in patients of CPP. Better pain management with yoga can help reduce dependence on NSAIDS and its associated side effects. This study was conducted in limited time period and the assessment of the parameters was done twice before and after study. If the study had been of a longer duration, multiple assessments would have been possible at regular intervals and then the trends of changes and long-term effects on yoga on CPP patients could have been determined. Further, we could not assess the levels of biochemical markers, i.e., brain-derived neurotropic factor (BDNF) and GABA because of resource crunch. Levels of these markers would have helped us to validate our findings more scientifically. Further work needs to be done in this field with a larger sample size and a longer follow-up to increase the efficacy and therapeutic value of the study. My sincere thanks to Dr. Jyoti Chauhan, Mr. Ashish Mishra, Dr. Krishan Kumar Goswami, and Mr. Tika Ram at Yoga and Naturopathy OPD and Lifestyle Intervention Center, UCMS and GTB Hospital, Delhi under Central Council for Research in Yoga and Naturopathy, Ministry of AYUSH for teaching and supervising the subjects doing yoga. My special thanks to all those patients participating in our study. Zondervan KT, Yudkin PL, Vessey MP, Dawes MG, Barlow DH, Kennedy SH. Prevalence and incidence of chronic pelvic pain in primary care: Evidence from a national general practice database. Br J Obstet Gynaecol 1999;106:1149-55. Bordman R, Jackson B. Below the belt: Approach to chronic pelvic pain. Can Fam Physician 2006;52:1556-62. Latthe P, Latthe M, Say L, Gülmezoglu M, Khan KS. WHO systematic review of prevalence of chronic pelvic pain: A neglected reproductive health morbidity. BMC Public Health 2006;6:177. Grace V, Zondervan K. Chronic pelvic pain in women in New Zealand: Comparative well-being, comorbidity, and impact on work and other activities. Health Care Women Int 2006;27:585-99. Yuan CC. Laparoscopic uterosacral nerve ablation and chronic pelvic pain. J Chin Med Assoc 2006;69:101-3. Howard FM. Chronic pelvic pain in women. Am J Manag Care 2001;7:1001-11. Zhu X, Hamilton KD, McNicol ED. Acupuncture for pain in endometriosis. Cochrane Database Syst Rev 2011;9:CD007864. Iftikhar R. Outcome of laparoscopy in chronic pelvic pain. J Surg Pak 2008;13:155-8. Haggerty CL, Schulz R, Ness RB; PID Evaluation and Clinical Health Study Investigators. Lower quality of life among women with chronic pelvic pain after pelvic inflammatory disease. Obstet Gynecol 2003;102 (5 Pt 1):934-9. Ortiz DD. Chronic pelvic pain in women. Am Fam Physician 2008;77:1535-42. Tekur P, Chametcha S, Hongasandra RN, Raghuram N. Effect of yoga on quality of life of CLBP patients: A randomized control study. Int J Yoga 2010;3:10-7. Koneru S, Tanikonda R. Role of yoga and physical activity in work-related musculoskeletal disorders among dentists. J Int Soc Prev Community Dent 2015;5:199-204. Rakhshaee Z. Effect of three yoga poses (Cobra, cat and fish poses) in women with primary dysmenorrhea: A randomized clinical trial. J Pediatr Adolesc Gynecol 2011;24:192-6. Collins SL, Moore RA, McQuay HJ. The visual analogue pain intensity scale: What is moderate pain in millimetres? Pain 1997;72:95-7. Sriwatanakul K, Kelvie W, Lasagna L, Calimlim JF, Weis OF, Mehta G. Studies with different types of visual analog scales for measurement of pain. Clin Pharmacol Ther 1983;34:234-9. The WHOQOL Group. WHOQOL-BREF: Introduction, administration, scoring and generic version of the assessment. Field trial version. Geneva: WHO; 1996. Rani K, Tiwari SC, Singh U, Agrawal GG, Srivastava N. Six-month trial of Yoga Nidra in menstrual disorder patients: Effects on somatoform symptoms. Ind Psychiatry J 2011;20:97-102. Sharan D, Manjula M, Urmi D, Ajeesh P. Effect of yoga on the Myofascial Pain Syndrome of neck. Int J Yoga 2014;7:54-9. 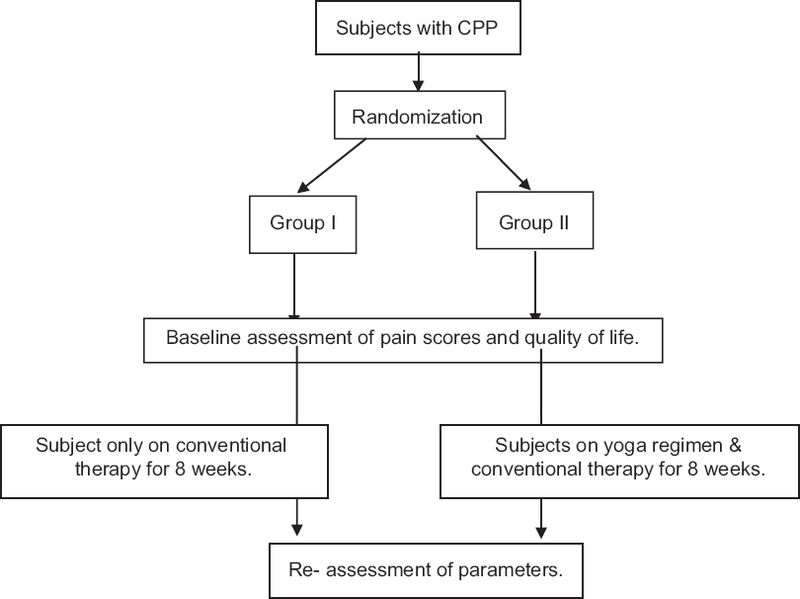 Nambi GS, Inbasekaran D, Khuman R, Devi S, Shanmugananth E, Jagannathan K. Changes in pain intensity and health related quality of life with Iyengar yoga in nonspecific chronic low back pain: A randomized controlled study. Int J Yoga 2014;7:48-53. Lee M, Moon W, Kim J. Effect of yoga on pain, brain-derived neurotrophic factor, and serotonin in premenopausal women with chronic low back pain. Evid Based Complement Alternat Med 2014;2014:203173. Crow EM, Jeannot E, Trewhela A. Effectiveness of Iyengar yoga in treating spinal (back and neck) pain: A systematic review. Int J Yoga 2015;8:3-14. Nayak G, Kamath A, Kumar PN, Rao A. Effect of yoga therapy on physical and psychological quality of life of perimenopausal women in selected coastal areas of Karnataka, India. J Midlife Health 2014;5:180-5. Jayabharathi B, Judie A. Complementary health approach to quality of life in menopausal women: A community-based interventional study. Clin Interv Aging 2014;9:1913-21. Streeter CC, Whitfield TH, Owen L, Rein T, Karri SK, Yakhkind A, et al. Effects of yoga versus walking on mood, anxiety, and brain GABA levels: A randomized controlled MRS study. J Altern Complement Med 2010;16:1145-52.